Part 1. Part 2 will appear July 5. Boeing KC-46As in the Everett Modification Center for military systems installation. Photo by Scott Hamilton. July 3, 2018, © Leeham News: Boeing’s development of the KC-46A aerial refueling tanker for the US Air Force is behind schedule and over budget, but production is underway and 34 tankers have been built. Deliveries are running more than a year behind the original schedule. Boeing is already in production on a fourth tranche of tankers even before the next contract is signed, which is expected this summer. Finally, after several delays, Boeing and the USAF announced the first tankers will be delivered in October, about 18 months behind schedule. LNC visited the Everett Modification Center (EMC) this month, speaking with officials of the program, who explained progress on the tanker line. Lessons learned from the six test airplanes, including two production models, from the unrelated P-8A program and the original KC-767 International tanker development are implemented on the KC-46A. The lessons benefit the production aircraft to date and will provide more efficiencies going forward. These lessons learned are reducing build time, refining designs, cutting costs and positioning the program for future efficiencies. James Burgess, VP and deputy program manager for the KC-46, said that the KC-46 production model was based “to some degree” on that used for the P-8A, the anti-submarine airplane based on the 737 NG, which is built at the Renton 737 complex. James Burgess, VP and Deputy GM of the KC-46A program. Photo by Scott Hamilton. “The P-8 was the first commercial derivative aircraft for Boeing where we did an in-line or an in-sequence production,” he said. Burgess came to the KC-46 program from the P-8. The Navy awarded the P-8 contract in 2004 in part based on the proposal to build the aircraft in-line in Renton, Burgess said. All previous military derivatives of commercial aircraft came off the production line as a “green” aircraft and modified post-production, he said. “Boeing Defense would buy a green commercial aircraft from Boeing Commercial. Generally we’d fly it to Wichita (KS) and do post production modifications, cut it up, install all of the provisions for military use and whatever structural mods were required,” Burgess said. “We do all of that after the plane rolled out of the commercial factory. “With P-8, that changed. We did all in-line engineering. All of the provisions to make P-8 a fully militarized aircraft were done in-line,” he said. When the P-8 rolls out of the factory, it goes to BDS as a fully provisioned military aircraft. “The number of aircraft that the Navy bought right of the gate (117 aircraft), it just made sense to do in-line modifications,” Burgess said. The P-8 production process created a lot of lessons learned for application to the KC-46, he said. Among them: engineering on the defense side that flowed into the commercial factory and the defense supply chain, with parts procured by Boeing Defense delivered to Boeing Commercial for installation. Although Boeing had serious challenges with the KC-767 tanker program, which was a commercial-to-modification approach, Burgess said the switch to in-line with P-8 was driven more by economies of scale vs. lessons learned on the tanker. Boeing took huge write-offs for the eight KC-767s produced (four each for Japan and Italy). Flutter was a problem for the wing refueling pods and in the first round of the KC-X competition between Boeing and Northrop Grumman/EADS (Airbus), which Northrop won, the USAF marked Boeing down for risk factors arising from the KC-767. 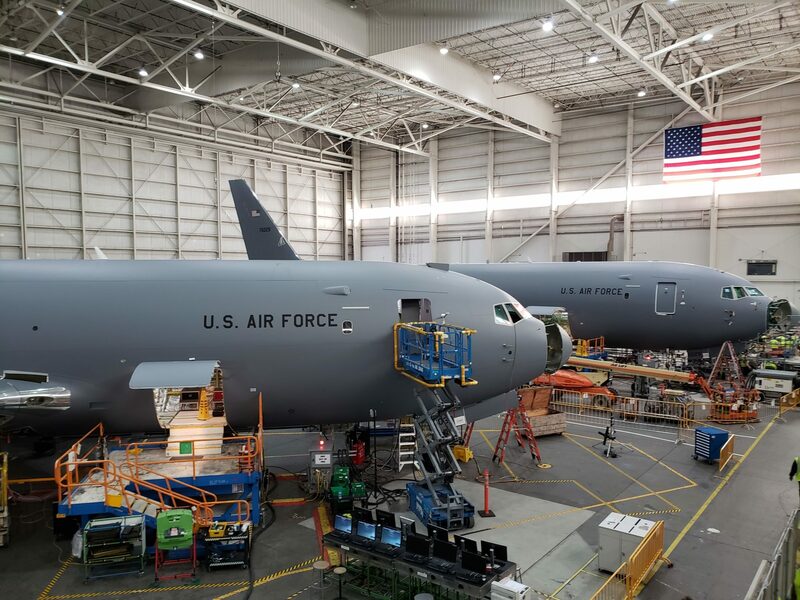 Like the P-8 and unlike the KC-767, the KC-46A comes out of the Everett (WA) Boeing Commercial Airplanes factory fully provisioned as a military aircraft. The KC-46A is a derivative of the commercial 767-200ER. The airplane is produced on the commercial 767 line, which today is entirety 767-300ER freighters. Military avionics, the refueling system, defensive electronics and other militarization is performed at the EMC. The refueling boom is built in and installed in the tankers at the EMC. “This facility is all about installation of the military systems,” Burgess said. The EMC originally was developed for the troubled 787 program. Rework and lessons learned from flight tests and production were implemented in 787s as airplanes came off the production lines and the early, notorious Terrible Teens were finally sold. The EMC now is used to effect changes identified as the KC-46A goes through flight testing and changes to production airplanes are identified. The wing pods, which proved troublesome on the KC-767, are delivered as a separate kit. Not all of the planned 179 KC-46As to be procured will have them; only about 40 will. All 179 will be equipped for the pods, called Wing Aerial Refueling Pods or WARP. Trailing from the outer portions of each of the wings, the KC-46A can refuel two airplanes at once. The boom, in the tail of the airplane, and the center-line drogue, serve different refueling requirements. The flight testing revealed issues—as flight testing often does, especially in military programs—that Boeing remedied in subsequent production airplanes. These “change incorporations” add to cost of the current production airplanes. So do ideas that emerged from the flight testing. “We made a commitment to the Air Force to begin the production system in parallel to the flight test program,” Burgess said. “All of the discovery and changes that come out of flight test go into a modification of the aircraft before they will deliver.” This adds to the initial Low Rate Initial Production (LRIP) time, but Boeing is transitioning into the “steady state” production flow. Among discoveries during flight testing: the in-flight refueling system (excluding the human-error fueling test that proved costly), software updates and some minor structural items. Boeing set up lab-testing for systems integration identified in flight testing that resolved issues going into the LRIP airplanes. The KC-46 can go completely dark, with the crew using night vision goggles in the air and on the ground. A lighting lab tests these operations. There is a fuel system lab in which fuel is flowed through the entire aircraft, including the boom and the drogue. Boeing’s previous 767-based tanker program, the KC-767 International, was a costly, risky program that initially weighed against Boeing in the KC-X competition. Burgess said there were lessons learned from operating the refueling system. The remote vision system was introduced on the KC-767. This is the video refueling process that is a major shift from an airman lying in the tail guiding the refueling boom to the receiving aircraft. The KC-767 encountered win refueling pod flutter issues. The pods on the KC-46 were reshaped and few issues arose, officials say. Burgess said the KC-46A is built over a 10-month period. About eight months are in the factory, followed by work in the EMC, ramp-side testing and about a month at Boeing Field for final flight testing and work before delivery to the USAF. Even as Boeing shifts from LRIP to long-term production, the USAF delivery timeline remains at 12-15 aircraft a year. Production time won’t shrink, Burgess said—but lessons learned, reduction of change incorporation and improved production techniques will reduce costs. The in-line production system adopted from the P-8 program is perhaps the highest-profile element of “One Boeing,” the concept introduced by former CEO Jim McNerney to leverage the knowledge between Boeing Defense and Boeing Commercial. The concept was applied to the KC-46. Years ago, when the 787 program was still in trouble and Boeing needed a surge line in the Everett factory to catch up, the only location available was one-half of the 767 assembly line. The 767 program was limping along as commercial orders dried up. Boeing decided to reduce the 767 line to the back half of the factory and in the process, undertook a lean manufacturing process that sped production and reduced costs of building the 767. At that time, the KC-46 tanker program was in its infancy. However, this move by Boeing Commercial Airplanes ultimately benefitted the tanker. The in-line production results in a KC-46 in production before or after a 767-300ERF. The freighter business is seeing an uptick that resulted in Boeing announcing a production rate hike in the entire line. Long-term, tankers represent the future of the 767 line, but FedEx placed an order for more 767 freighters this month. “The design of the KC-46 leveraged heavily the freighter design,” Burgess said. The basic floor of the freighter is in the tanker and many systems are identical. More about Boeing’s KC-46A tanker program will appear in future posts. 34 KC-46A tankers have build, first delivery later this year. Wow. Imagine 34 A400M’s being parked all over Seville airport fro technical reasons. After LM was being sidelined by politics for inexperience/ costs. The verdict would be swift, ruthless & irreversable. This is why Boeing’s contract pretty much says that Boeing pays for all the late fees and doesn’t get to ask for more free money. If it wasn’t for the 737 cash register B would be deep under water. Lockheed would have gone bankrupt doing the same contract with the F-35. Airbus would have lost funding and have had to scrap the A400M after the second round of delays. If they loose money can they take if off on their taxes? Ah, still $2.5 Billion—after taxes! Ouch! I do think 100 A320 gliders driving around Toulouse is analogous. That was not under Airbus control. The KC-46 is fully under Boeing’s. What does EMC stand for? Have I missed that? Everett Modification Center. It is in the line above the “Learning from the P-8” heading. Everett modification centre,it does actually say near the top. BDS?Boeing defence services? BDS is “Boeing Defense, Space & Security”. They added security onto the end to “reflect the scope of the business” recently. First of all, no mention of who, if anyone, was responsible and/or “walked the plank” for the $2.5 BILLION in BA after tax losses on this program. (I’m looking at you, Caret, or did political correctness save your position? NB: Will your head finally be on the chopping block if BA doesn’t win the upcoming TX comp? And, not to be sexist, Muilenberg can thank his lucky stars the commercial side of the house overperformed during this fiasco.) It’s absolutely crazy the BA Board has had no public comments on this financial and public relations fiasco! In hindsight, though, it would have been better to let AB win this tanker competition. (AB would have been “buried” in AF specs, change orders, delays, overruns, etc. Would have made a nice defense follow on fiasco to the A400M Grizzly/Atlas! LOL) Lastly, the description of learning from the P8 line makes little sense when the a/c have to be towed over to the EMC for military avionics, boom, pods, etc. I agree about AB,but change orders are what defence contractors go to bed dreaming of. The P-8 makes a short hop from Renton to Boeing Field for installation of mission systems. At least the KC-46 doesn’t need to be flown to the finishing facility. I understand from other stories that Boeing built a new hangar at Everett for its usage as KC46 EMC. The story gives the impression its existing buildings that were used for 787. ‘Ramey said Boeing also has been completing tankers in the EMC since the beginning of the tanker program. He declined to comment on the addition of the second tanker space there. The P-8 is actually on its own separate line (Boeing has several 737 lines all at Renton, it is not just one 737 production line). I believe right now the line can handle both the P-8 and regular 737NG but the line will continue making the P-8 (and just the P-8) when all the other lines have switched over fully to the 737 MAX from the 737NG in a few years. Even then as Mike mentioned above there are still equipment installed later. The 767 tanker is being built on the same line as the commercial freighter. Installing all the military equipment on the line would be too disruptive to the output of commercial freighters (as it would take longer time on the line blocking the freighters), and there are not enough commercial orders or space to justify giving the commercial freighters a separate line. Still the tankers are being built with the provisions for the military equipment on the line, making later installation easier. This is different than the old method of building it just like a regular commercial aircraft then cutting it up and modifying it later to install the military equipment. Boeing has 3 main 737 lines and one P-8 line. When the shift over to the P-8 takes place? There used to be DOD regs on keeping military production lines separate, to the point of bring in separate buildings, even. Has this requirement “gone away”, or were waivers granted? Scott? Boeing must comply with DOD security and ITAR regs on the 767/KC-46 line and has procedures in place to do so. The story about the KC46 assembly line seems contradictory. ‘The KC-46A is a derivative of the commercial 767-200ER’ That of course is the passenger model long out or production. There are differences between freighter and passenger models mostly relating to main deck strength, cargo door and other stuff, and of course the -300 model has HGW which leads to beefed up structure. It would not make sense to have the line making ‘standard 767-300F’ freighter and then have a military freighter that is based on the out of production 767-200ER fitted into that. I believe the issue was width not length. I never saw what I considered and answer for the unique 767 2C length. Logically the 300 would be it rather than cut a few feet off the fuselage. If those few feet made a different and A330 is worse so it seems there is a more technical reasons. The unique length of KC-46 is due to the boom trailing behind the rest of the aircraft. 767-2C has the same length as any 767-200. The short fuselage was necessary to get a heavy 767 up in the air from a short runway. If that is true they they could have gone with a 200 and not a much more expensive 2C. Well with so much they did right, what could possibly go wrong? I guess its a darned good thing they did it so perfectly, learned all those lessons or the KC-46 would not have arrived until 2030. As I recall there was a movie, The Gang That Could not Shoot Straight . So Boeing only has one ( A ) team (and isn’t that ironic, does Airbus have A teams?) and the Air Force feels rather strongly Boeing did not have it on the KC-46. Obviously not the Golden State Warriors with a really really deep bench. Yes all those cuts and whacks have consequences. But once committed the USAF is stuck with it (for now). Frankly at this point I think it would have been a great thing to give Airbus 30% of the contract if they matched the price. Its funny you should mention the KC10, because that seems to be what the KC46 will be replacing in the short term. Of course that solves the problem of having a ‘KC10 replacement program’ which Airbus might win. The A330MRT could well be the close to perfect KC-10 replacements. Standard model and not to the combat area KC-46 specifications. It has appeal to me to compete the tankers based on fuel needs and uses as well as the threat environment. Maybe a way to keep Boeing on its toes and at leas get the B B team and not the B z team. The KC-10 fleet is nearly done. Not due to aerial refueling but due to Cargo missions. The C in KC. USAF had chosen A330 because of better cargo capabilities. – I don’t know at what price Boeing is selling freighters to keep 767 production alive for tanker production. KC-46 is still a far more economic freighter than C-17. I would like to see some attribution as to the KC-10 being used for Cargo. Its done because its an old plane and no one fly’s it (hardly) any more. FedEx is dumping or has dumped their and they the MD-10 Cockpit. MD-11 oddly is quite popular and looks like into the 2030 area for it. Keep in mind, the US has a lot of freight options that others do not. Tankers in USAF use fall low on that mission use. Nearly more than half of KC-10 fleet was reserved for transport only during first Golf war (search for KC-X next mobility platform). The C-5 and C-17 are far more expensive to operate and maintain than civil aircraft. To transport cargo to Saudi Arabia a C-17 would require aerial refueling. So why not use a tanker without the need to refuel? Some USAF generals said C-17 is running to fast out of lifetime due to parcel services. C-5 and C-17 should only used for outsized cargo or air drop. The KC-135 can hardly transport cargo therefore is used rarely for refueling. 2 or 4 light military pallets. Main deck has a very weak floor. CRAF is not so easily available and much more expensive than own aircraft. 707 / KC-135 was retired from airline services far earlier than DC-10/MD11. The Gulf War was a crisis to the US and its allies. That does not mean the KC-10 was worn out. Harder to get parts for, may not pay with only 59 and others that can replace it. The Bigger A330 did get the wide eyes of the USAF. It was “chosen” illegally, the RFP did not give extra credit for extra capacity. I understand Europeans are a lot looser on legalities but the US is not allowed to do that. Nasty court rulings and all that. If the USAF wanted to replace the KC-10, then they should have presented the program as just that. They claimed (falsely) the KC-135 had to be replaced. That was the RFP and that is what the 767 is, as close to a KC-135R replacement as you can get. An A330 with full tanks is going to give up cargo that a C-17 can carry to where it gets split out (Kandahar). C-17 can carry outsized cargo. Come on over, lobby congress for an A330MRT and I will support you. The problem is KC-135 isn’t a capable transport aircraft at all. Therefore „The USAF use profile show that less than 25% of missions have cargo involved“ is true but will not be the missions of the future kC-X. Would the UASF rate the new bomber on B-52 missions? The KC-135 mission fixation was to keep the 767 in the game. All A330MRTT orders so far are for airline seating because the A330 carries all the fuel in its standard tanks and the lower cargo deck is still available. C-17 has a range of 2,400 nm while an A330-200F carries the same load at 4,000 nm. The C-17 is for outsized cargo. That’s why USAF is in pain to use this aircraft to move troops and parcels. Why in the world would you support that? The A330-MRRT’s lower hold dimensions are not even compatible with a CH-46 configured 463L pallet, let alone a FULLY LOADED 463L pallet that can be over 7 ft tall and can weigh up to 10,000 lbs. The USAF requirement was for a FULLY LOADED 463L pallet. They didn’t want to have to restack pallets in theater for trans-shipment. Now, if Airbus would be willing to come up with a tanker based on the A330F with a real main deck cargo floor and door, then I would support the USAF selecting it for a development program. I think it would make a good KC-10 replacement and I think competition for Boeing would up their game. All the rest is nit noid. You are aware big chunks of the 767 are made in Japan? More jobs in the US. Even if it is Alabama! We can turn them into Democrats yet!!!!!!!!!! Unions and all that. The only way the A330MRTT makes a good KC-10 replacement is in tanking fuel capacity. It does not replace the KC-10’s cargo capability. Yes you can talk all you want about total cargo weight capacity and enough floor space for a bunch of 463L pallets, but the A330MRTT is just not capable of hauling any fully loaded 463L pallets (over 7 ft high and up to 10,000 lbs). The Airbus guys will reply that there is a main deck cargo door option, but that no customer has wanted or needed it. Well, the USAF needs it. How about an option for a main deck cargo floor because no one is strapping 10,000 lb pallets down onto a passenger floor. Also, how about an option for a level cargo deck? The USAF is not going to have one set of loading equipment for all of its cargo carriers, C-5, C-17, C130 etc. and another set just for the A330 MRTT. Bottom line is that the cargo capability of the A330 MRTT, while fine for small air forces that want to carry a lot of passengers and don’t worry about seamless integration into an existing large cargo system, just doesn’t cut it for the USAF. I’m so glad our guys are not going to be stuck restacking pallets in theater, because they are saddled with a plane that just isn’t compatible with the way the USAF does things. You call these issues nit noid? I’m surprised to hear you say this because you are kind of sounding like the managers I always here you criticizing in this forum. Yes, the main mission of the KC-46 is tanking, but that doesn’t mean the USAF isn’t interested in making sure that the KC-46 is a competent cargo hauler. In the RFP they valued highly the ability of the winning aircraft to seamlessly integrate into the current air mobility system. Yes, I want to keep jobs in the US if possible, and yes, I’m very aware that lots of the 767 is made in Japan. So? Like I said before, if Airbus offers an MRTT based on the A330F then I would be all for it, especially to give the USAF competitive options. However, I honestly think as it stands now, being a version of the A330-200, the USAF will never order the MRTT. You may disagree, but this is my opinion based on what I know. I think won-lost-won tanker selection and mechanics behind it will be forgotten / rewritten over time. Unfortunately it all happened when internet was there & that can’t be erased. But this nice interview is about production. It tells us a lot has improved, lessons have been learned. Scott says so, so there is probably truth in it. I’m convinced the KC46 fleet will add great value, it’s capable, efficient and has strong cargo capability. The issues will ironed out over time. The “second best” will provide good value. That’s why congress changed the rules and gets what it wanted. Good point its all about production and not the mess and delays. On the other hand the internet has nothing to do with it, you still have to pick thorough the sources and documents and those are more readability available. As the USAF is the last one flying the DC-10, might be a good place to do a contract for A330MRT to fill that roll. I talked to a KC-135 crew chief at Travis AFB open house last year and he agreed w/me that the K-46A is fairly lame when you realize that its gross weight is about 90k lbs. more than the 135 but it carries only 20k lbs. more total fuel load…and no winglets and old design engines. You would think that they could have used the wing developed for the 764 which allowed a gross weight of +/- 450k lbs., about 50k more than the as built 46. Empty weight would have been a bit higher but most of the extra would be fuel. It seems that they designed it down to the bare minimum requirements which were themselves set to align with the 762 ER. For my tax money I’d say just keep the 135s flying. They’re old but the fuel load is almost twice the empty weight or +/- 65% of the gross weight. Quite an impressive old aircraft. It gets even more confusing when you know the KC46 for Travis AFB are replacing its KC10s which have a max fuel load of 356k lbs. While C5 and C17 go long ways, they typically do fuel up on the way to the Middle East. Keeps them going to where they need to be and not landing to fuel. While I do admire the KC-135R, it has been upgraded with the well proven CFM engines. KC-135 does not have seat capacity (if and when used) and does not have the cargo capacity (seldom used but useful at times). As they plan to keep the KC-135R into the 2030s or 40s we get the best of both worlds! Note: FedEx supports an operation called Orbis that does eye surgery and training out of a DC-10 all over the world. They gave them an aircraft and then changed that and gave them another one. The reason was they wanted them to have an MD-10 type (glass cockpit at the same level as the MD-11). they supply the pilots as part of the support and as the DC-10 is rapidly going away if not gone, they did not have pilots current in that aircraft. As the can cross train between the two types they can continue to support Orbis. All those factors add up. KC-135 requires a skill set that no one else uses or has. KC-46 is up to date with the current cockpits of the 787. At some stage it was invented (not by USAF) the A330 was too capable & the KC767 just right. Not easy to come back on that. Even now. Since then no Air Force has judged the MRTT too capable. Contrary. At some stage it was invented (not by USAF) the A330 was too capable & the KC767 just right. It was probably invented by you, like most things you post. The reality is that the USAF went to congress and asked for a KC-135 Replacement. The KC-46 met that requirement the closes. The RFP made it clear that they wanted the lowest cost and did not want to pay for more capacity. That need is based on having a lot of tankers in a lot of places. So yes the A330MRT did have too much capacity for what the project was. You increase things and you incur greater costs. While the A330MRT may well be a good replacement for the KC-10, currently they don’t have a program going for that. The KC-46 is more in line with Fighter needs and can do both center drogue and boom on the same flights and as noted, Win Pods on some in addition. UK A330s are limited to drogue. Not as flexible. However the USAF could never adapt a better idea so the F-15, F-16 are boom fed even though the size does not remotely require it. the F-15 & F15 (and F-117, 22, 35) are boom fed because that is what the air force has in terms of refuelers. the KC-135 can be converted to hose & drogue for a particular mission, but then the boom can’t be used. by keeping all the receiver aircraft in the AF inventory using the same system, the tankers have maximum flexibility to tank up whatever AF aircraft is nearby, rather than being fighter only or heavy only for any given flight. The Australian KC-30A operate with boom and refuel UASF jets for years. RAF Voyager was delivered after KC-30A. USAF did not ask for a KC-135. They wanted a new mobility platform also useful as a tanker. The reduction to KC-135 tanker replacement was made to keep the 767 in the contest. The 767 did finally win on stacked fuel calculations assuming more than 7 touch&go maneuvers for every flight ever made by any KC-X. A lighter and less capable aircraft like a Super Cup burns for sure less fuel. On the other side USAF also requested simulators to avoid training requirements for KC-X. A lot of fuel was wasted to feed the KC-135 and C-17 because the KC-X was delayed by Boeing for more than 5 years by running to GAO. MH: The Australian A330MRT just got certified for the full range of missions just last year. What they had for years was a passenger aircraft that could not execute the full missions suite because of “deficiency”. It took them 5 years to get it fully operation. You can bend, fold spindle and mutilate it until the cows come home, you can’t change the base facts. The USAF selection committed violated US law in what they did and got caught at it. Its unusual for those to be overturned. This was so obnoxiously (blatantly) done that it was done so and for multiple reasons of the USAF totally ignoring their own RFP. When the RFP was enforced, Boeing came in under 10% – that save me money. That is what it was all about. Aerial fueling was for strategic aircraft originally. The boom made sense. By the Time the F-15, F16, F117 came along, the hose and drogue system was solidly in place. There is no reason the USAF could not have added drogue pods to the tankers, they should have. The US Navy and all allies use it. That was a poor decision as was just adding a one or the other drogue and not putting pods on it which wold have allowed two fuelings at the same time. The USAF leadership is one of our worst enemies. Do you really think the KC-46 will have full operational capabilities from day one on? Accepting an aircraft is still way to go for initial operating capabilities. Boeing’s charge delayed a new aircraft by about 5 years. During this time C-17 and KC-135 had to perform missions any KC-X could have done cheaper. It depends on what you designate as day one. But for the sake of discussion, let’s designate the beginning of operational testing as day one. KC-46 operational testing is slated to begin in October 2018, which is essentially the same time as the initial delivery and will last for about 7 months. According to USAF program officials, Boeing is required to have 8 receiver aircraft certified by the beginning of operational testing. Even if all 8 are not certified by the beginning, barring an unforeseen catastrophe they will all be certified by the end of operational testing, which is May 2019. These 8 aircraft are a mix of boom fed and hose fed, and probably include the F-16, A-10, C-17, KC-46, F/A-18 and AV-8, all of which the KC-46 has already refueled. It was the USAF improperly awarding the program to EADS that delayed a new aircraft. A heavier and more capable aircraft like the 777 burns more fuel, so what is your point? The simple fact is there never was an KC30 built to USAF specs. The USAF is going to use the C-17 regardless, they don’t just want them sitting around doing nothing and they need to keep crews current. You keep assuming that the KC program was about cargo, it was not. We want cheap we have the CRAF and that is used even more than minimum required. Europe (not on the Soviet border) lets their capability atrophy. The US keeps it active. Finland, Sweden, Poland and the Baltic all being in the mouth of the bear think differently (and do so with their dollars and little as those may be for the Baltic’s. Scott, Happy 4th! OT, but only slightly as it would still affect the 67 line, do you know if Amazon is near placing a direct order with BA for 60 follow on 67 freighters? I got the 60 number as they are constructing a 100 a/c mega-facility in Cincinnati, and rumors have swirled on this potential order since last fall. And would BA further increase the 67 production rate to keep Amazon happy on timely deliveries? Thanks, MO. Amazon is looking for new build only, per the articles I’ve seen. There are multiple issues cited re: the limited availability and suitability of 67 pax frames. You never know with negotiation tactics by large companies. What they want and what they can get? Or FedEx keeps ordering and time to get in line? And if you can’t get what you want you take what you can get. Note they companies are calling for a LARGER A330-900 (longer) for the freighter. That really gets into 777 area. Boeing has that in active production and capacity. Also keep in mind that longer A330NEO would only work for Amazon and UPS.